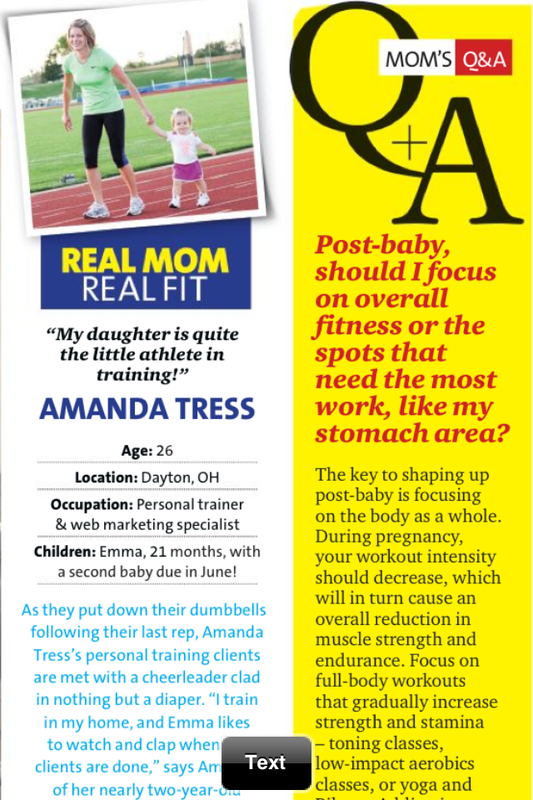 Emma and I were thrilled to be featured in Oxygen Magazine’s May issue. This was a very exciting week for Miss Emma (my 19 month old), Baby Boy (28 weeks pregnant), and me. Earlier this week a girl found me on Instagram (ps, my instagram is @amandajtress) and said that she saw me in Oxygen Magazine. I had been asked to do an interview, and send some photos with a model release form, but I wasn’t sure when I would be featured in the mag. Turns out, Emma and I are in the Fit For Two section of their magazine and there is a really cute write-up about us. I am honored to be in this national magazine, and I hope that it will be a foot in the door for future appearances in Oxygen. I was also featured today on fitpregnancy.com as one of their “favorite pregnant mammas.” I really like that website, so I was happy to see my photo there. One of the best parts of my jobs is meeting new clients. I started with a couple new gym clients this week, and I am so excited to help them reach their fitness goals. However, one of the most fun new clients I had this week was a one-time fitness and nutrition consultation with a girl from the West Coast over Skype. She and her husband are hoping to get pregnant within the year, and she is being proactive about developing a healthy fitness and nutrition plan pre-pregnancy. LOVE THAT! She is a trainer’s dream come true since she is committing NOW to be healthy (before she gets pregnant), and it was a blast to consult with her about a workout and nutrition plan. AND, perhaps the most exciting update of the week is that my Fit Pregnancy Total Body Workout DVD* is on a UPS truck on the way to my house. I thought it would be here by now, but Easter slowed things down a tad. I am leaving for FL tomorrow morning (at 3.30 a.m., yikes), so my assistant is going to mail out the first round of pre-orders on Tuesday. Woot! If you haven’t had a chance to pre-order your DVD yet, don’t fret! Be sure to order now. As a reminder, this is a great total body workout for those in a pre-pregnancy fitness plan, all three trimester of pregnancy, and post-delivery recovery. However, I’ve had a few of my current clients purchase the DVD as well because it’s really just a great workout, plain and simple, pregnant or not! I am enclosing my personal trainer business card with each order with all of my contact info so those who order have a direct line to ask me questions about fitness. I am thrilled to meet new people through the process. I hope you had a great week too and are already enjoying a relaxing weekend. I am currently on day one of my last paid vacation (since I am leaving full-time salaried work on April 30). I plan to enjoy every minute and will keep you updated via my Facebook page. * This DVD workout is intended for women who are pregnant and wish to maintain their fitness levels through their pregnancy. It is not intended as a beginners exercise and prenatal workouts should not be attempted without first having discussed with your physician or midwife. Not all exercises are suitable for everyone. As with any exercise program, if at any point during your workout you feel faint, dizzy, or have physical discomfort, you should stop immediately. You are responsible for exercising within your limits and seeking medical advice and attention as appropriate. 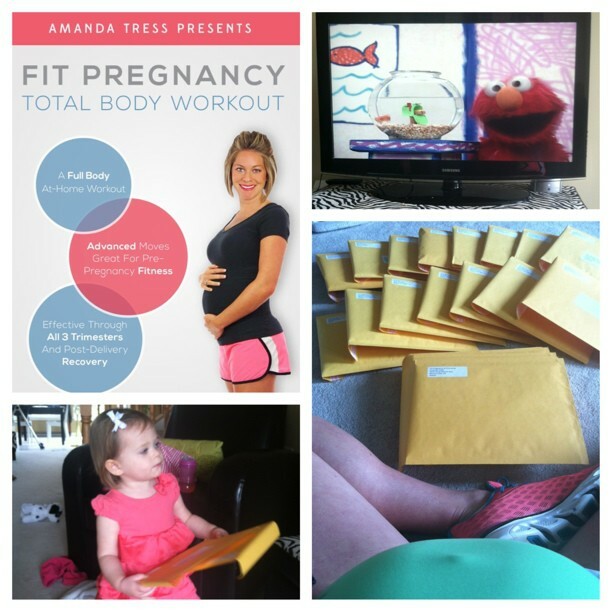 Neither Amanda Tress nor Fit Pregnancy and Parenting (nor any individual or corporations associated with the production, marketing and distribution of this DVD) assumes any legal liability or responsibility for any direct, indirect, consequential, special, exemplary or other loss, injury or damages that may result. Nor is there any guaranty, warranty or formal representation about the personal benefits of this DVD. You participate in this workout at your own risk. Thanks Joe for the great tips on how to stick to our daily workout scdheule! I like the idea of a workout buddy and also creating a habit by doing it at the same time everyday! Looking forward to your next show.